Grapes can be grown in the Kenya. This has been proven in Naivasha where they have been growing grapes since 2000. Grapes like terrain that is somewhat sloping so as not to lodge water and hurt the roots. Grapes grow best in areas with warm and dry climate and where sufficient irrigation is available. Places frequently by typhoon and continuous rain are least suitable. Growing conditions, however, vary depending on the variety. Most commercial vineyards are below 1,000 feet in elevation, some almost at sea level. Muscadines variety are well adapted to the warm, humid conditions and therefore will grow well in all humid areas. Ripe grapes are sweet and juicy with a distinctive fruity flavour. Vigorous self fertile vine with medium sized (15-20mm), round golden-bronze fruit when ripe. It can set a small percentage of smaller seedless fruit. Highly disease resistant and should not require spraying making them ideal for coastal subtropical climates. Growing grapes from seeds is not the ideal way of reproducing a grape vine as the genetics of a variety is not completely carried over by the seeds – in other words, if you plant a Concord seed, and you successfully get the seed to germinate, the chances are good that the new grape vine will not have all the true Concord characteristics! This is a very time consuming process as it can take up to three years to propagate a new grape vine from seeds. Another big problem with growing grapes from seeds is the fact that a very low percentage of the seeds will germinate. The grape seed is covered with a very tough seed coat that keeps the seed dormant until ideal conditions for germination. 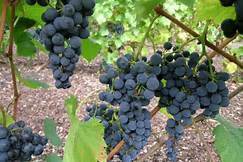 Should you decide to grow grapes, several factors would have to be considered. 1. Location. As mentioned above, the local climate will determine which varieties would grow best in your area. Grapes vary in flavor, color, size and texture. Some are sweet and ideal for the table, others are best suited for jellies, juices and wines. 2. Sun. Grapes require full sun. If you don’t have a spot in your yard that’s sunny all day, find a place where it can at least receive the morning sun. 3. Air flow. Good air circulation helps to prevent fungus’s from attacking your vine. Find an area away from trees, tall brush or buildings that can block breezes from blowing into your vine. The secret to growing very productive grapes is good pruning. It’s probably the most important and demanding task you’ll have to do in caring for your vines. Note that fruit is produced from the current season’s growth, which in turn grew from the previous season’s wood. So don’t be afraid to remove up to 90 percent of last season’s growth – your grapes will grow better because of it. Heavy pruning produces the best quality fruit, while light pruning results in large yields of poor quality. Also, if you want to produce bigger fruits, cut off every third bunch the moment they form so that more energy goes into developing the remaining fruits.